If you’ve read or heard anything about UDL, you have been told it is a framework. A framework. What the heck is a framework? With apologies to my high school chemistry teacher, let’s talk about the Periodic Table of the Elements. The Periodic Table of the Elements provides a framework to help users see how the elements are associated, how they can work together, and their overall properties. The table even helps scientists predict what additional elements might look and act like. This framework guides the thinking chemists have about the elements but doesn’t tell them everything there is to know about chemistry. This graphic by Unknown Author is public domain. Now, let’s switch to the UDL framework. The visual representation we most associate with UDL is the UDL Guidelines. 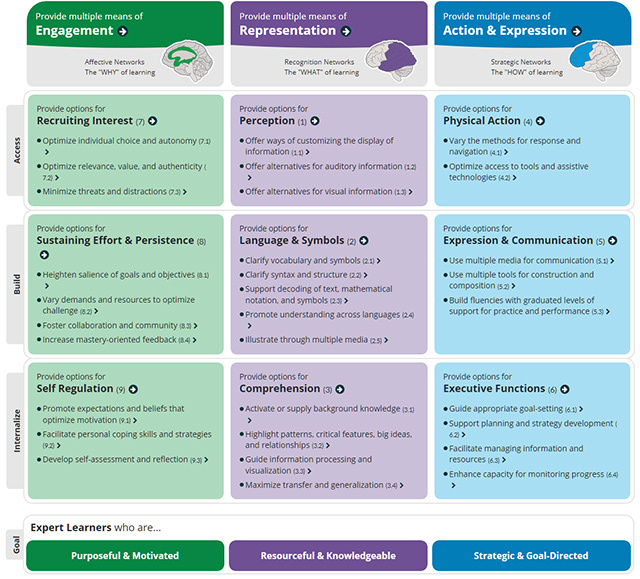 Similar to the Periodic Table of Elements, the UDL Guidelines represent the UDL framework to help educators see how researched practices are associated, how they are interconnected with one another, and how they are organized so educators can see their base purpose. The UDL Guidelines provide you with a lens to investigate practices and see whether they promote quality outcomes for all learners. How you learn about either of these frameworks can make a difference in your implementation. CAST (2018). Universal design for learning guidelines version 2.2 [graphic organizer]. Wakefield, MA: Author. 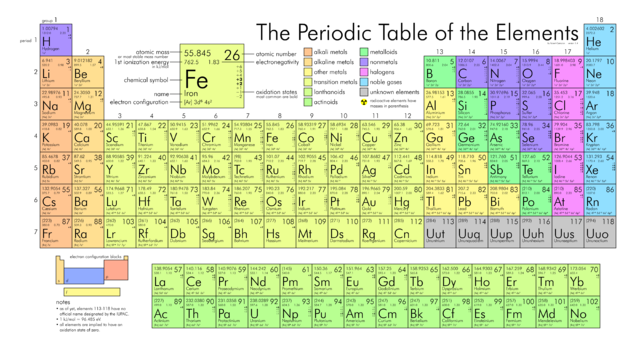 I was not familiar with the table of elements before I took chemistry in high school. How we initially learned about it was overwhelming to me. We had to memorize all of the elements and write them into a blank table in a prescribed amount of time. This activity was reminiscent of the 3-minute timed multiplication tests I took in 3rd grade. I didn’t do well in 3rd grade and I certainly didn’t do well my sophomore year. Memorization was to be our gateway to learning more deeply about the elements themselves. Needless to say, memorization and quick recall were a barrier for me, so that gate never opened for me. I interpreted chemistry as “not-my-thing” until I took it again during college Masters level courses. Then, I loved it! I believe it was because the professor was quick to get us into learning the relationships between the elements and doing something with them instead of memorizing them. You can and should use the same approach with UDL. While it is certainly helpful for educators to learn about the different guidelines and checkpoints as you can at the CAST website, it is understanding the design of the framework and putting those guidelines and checkpoints into action that makes UDL so powerful. You can read more about that in Design and Deliver: Planning and Teaching Using Universal Design for Learning. Understanding why there are three principles and how those connect back to the three brain networks helps you uncover how different strategies and actions impact your students. Understanding whether you are providing students access to learning, you are helping them build on their current skills, or you are helping them internalize skills gives you control over the design you are creating. Understanding the interplay across the guidelines and seeing how they build on one another guides you to see how the framework holds together. And understanding the crucial driver of variability and how the foundational elements of access, flexibility, goals, rigor, and choice flow throughout the framework helps you pull the framework together. Going back to the table of elements. You don’t “do” the table of elements just like you don’t “do” UDL. You use the table of elements to make intentional decisions, to plan experiments, and to predict reactions. You use the UDL Guidelines to intentionally design your lessons and learning environments because you know you are going to have variability across all learners. The consistency driving the framework is learner variability and your consistency is your use of the UDL Framework. All of us in the UDL community are like chemists. We are in a field that is rooted in consistent and persistent discovery, challenging research, and a lifelong quest to investigate all that the framework holds. I invite you to jump in, revel in what is familiar, get excited about learning new information, and give yourself time to explore the depth and breadth of this beautiful framework.